Located down in between Eastern Europe and Western Asia is the beautiful country of Georgia. This small region is covered with amazing mountains ranges and gently rolling hills. The summer sun burns hot in the area and the winters turn your breath into a cloud of smoke. Visiting this country is sure to marvel the eye with its many brilliant features. However, there is nothing that will knock the wind out of you as much as the sight of the amazing Katskhi Pillar. The Katskhi Pillar towers above an incredible mountain view that is full of luscious green trees and a blue swirled atmosphere. This amazing formation stands out alone and reaches high above the landscape. 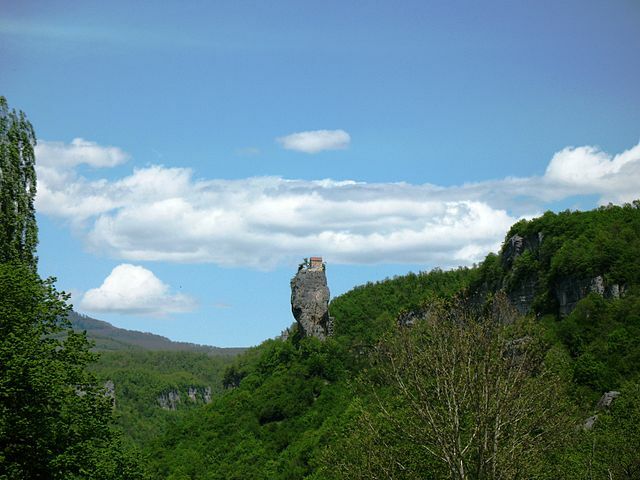 At an angle, rock tower protrudes upwards as if it wants to touch the sky. The Katskhi Pillar starts at the bottom with a narrow base, and fills itself out toward the top, leveling off to an incredible platform. 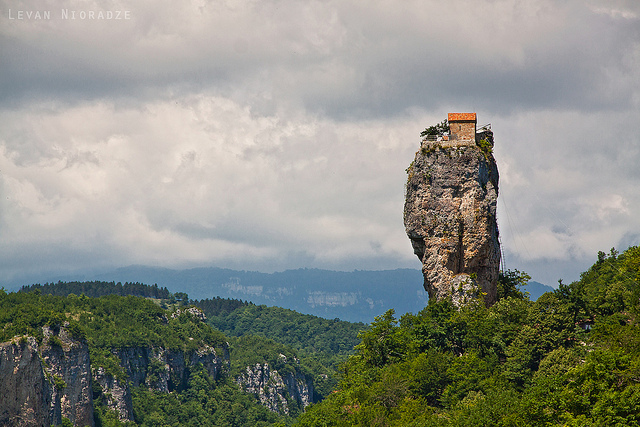 A monastery was built in 1993 on the top of this astonishing landmark. Padre Maxim of Chiature had a passion to see the monastery built. He lived at the bottom of the pillar for a period of time, before he received the money from a friend to build the house of God at the top of the rock formation. The government of the country of Georgia immediately stepped in to make the construction take place. To get to the top of the tower, there is a steel ladder that has to be climbed straight up. 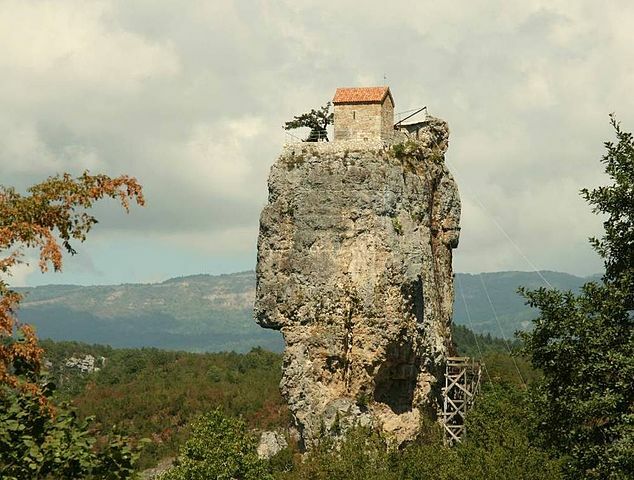 The monastery is an incredible 40 meters off the ground. With the support of the surrounding community, Padre Maxim is well taken care of and has no worries of running out of food and necessary items to survive. Surrounded by the misty mountain air atop an awe-inspiring natural creation, he desires to serve God and pray for the sins of the world. There is no doubt that this breathtaking piece of nature is a surprising sight to behold for any onlooker. Not only does it hold indisputable beauty, but it houses a wealth of culture that is being lived out by an amazing individual.